Bring on ALL the comfort food! 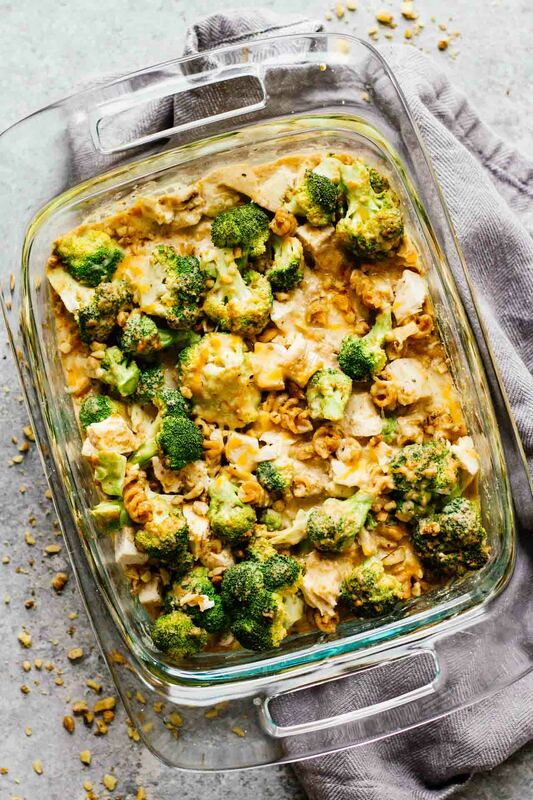 Now that fall is basically here, a warm, cozy, creamy, pasta-filled dinner like this Healthy Chicken Broccoli Pasta Casserole is EVERYTHING! I would say that fall is actually here, but I’ve heard many of you say that a heat wave has come through your area in the past couple of weeks! Oklahoma seems to only have just now noticed that fall is approaching. We had cooler temps last week (rainy and high of 68 – hallelujah! ), but this week it’s back to the 80’s. 🙄 C’mon, Okla! I thoroughly enjoyed that one high-of-68 day, though. Worked from home all day, snuggled up on the couch, listened to classical piano, and had my favorite vanilla candle going (with a wick that crackles, BC when you don’t have a real fire place, you do what you gotta do). It was the best! And to top it all off, I made this delicious Healthy Chicken Broccoli Pasta Casserole for dinner. 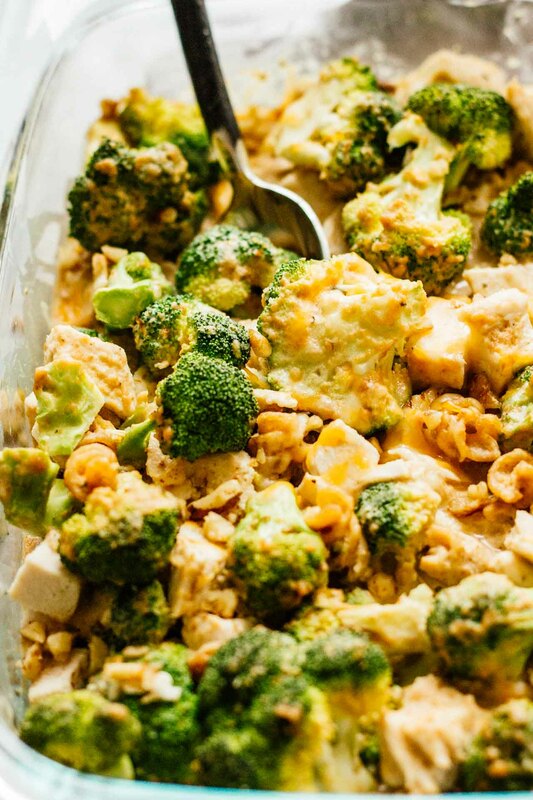 This Healthy Chicken Broccoli Pasta Casserole is perfect for a cozy, fall dinner at home! Or winter. Or spring. Or summer. Basically it’s great for dinner anytime, anywhere. Need proof? JUST LOOK AT IT. The cooked chicken in this recipe actually came from a whole chicken I had roasted earlier in the week. Side note on that: this is SUCH a major time saver in my life! All I do is roast a whole chicken in the oven using this oven roaster and then use the meat in recipes (like these Healthy Sriracha Shredded Chicken Tacos) throughout the week. I wrote an entire post on it, so be sure to check it out! Another option is to use a roasted chicken from the grocery store. They always smell amazing, don’t they? 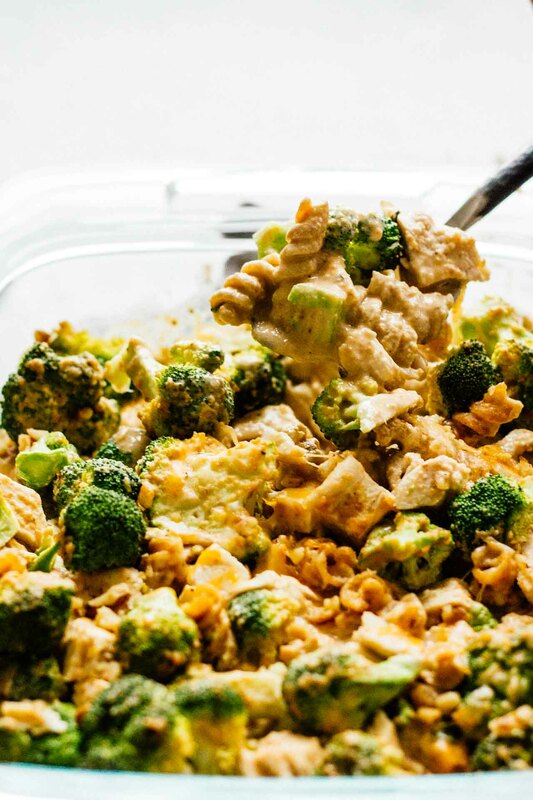 If you’ve ever bought one and needed a way to use the leftover meat, this Healthy Chicken Broccoli Pasta Casserole is a great recipe for it! 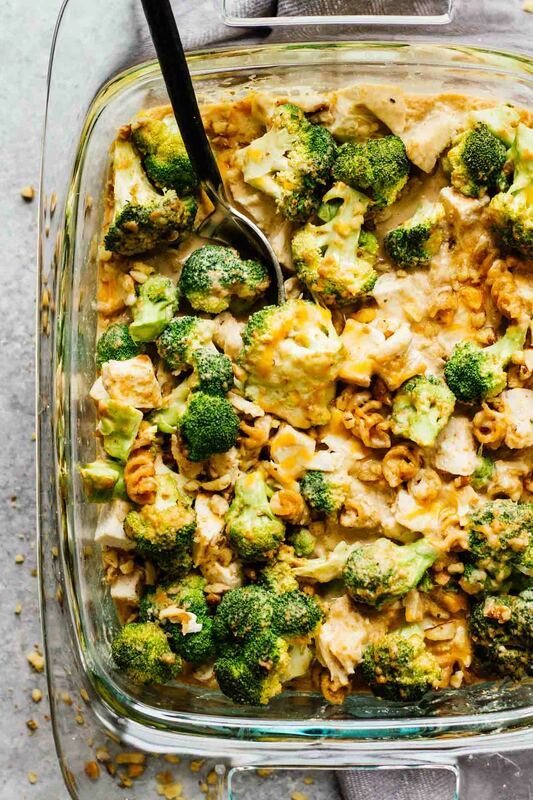 This Healthy Chicken Broccoli Pasta Casserole is gluten-free, dairy-free, one-pan, and only takes 30 minutes to make. Sooooo delicious! Mix the almond milk, chicken broth, cashew butter, and almond flour together. Set aside. Place the dry pasta in the bottom of a casserole dish. Layer the broccoli on top of the pasta. Pour 3/4 of the almond milk mixture over the pasta and broccoli. Bake for about 15 minutes (or until pasta is soft). Remove the pan from the oven and add the chicken. Pour the remaining almond milk mixture over the casserole and add optional walnuts and vegan cheese. Bake for another 10-15 minutes (or until everything is hot).